Over the years we’ve received requests for bright orange hunting garments to help keep dogs safe and visible during hunting season. We’ve created a line of dog hunting gear that’s easy to see and quickly distinguishes your dog from prey. The prolonged hunting season creates the need for high visibility over several months and different seasons. Hunting dogs as well as free roaming dogs in the mountain towns are often shot by mistake. It’ll be easier for you to spot your dog when out for a walk. You can choose a hunting dog coat, sweater or accessory that’s right for each season. 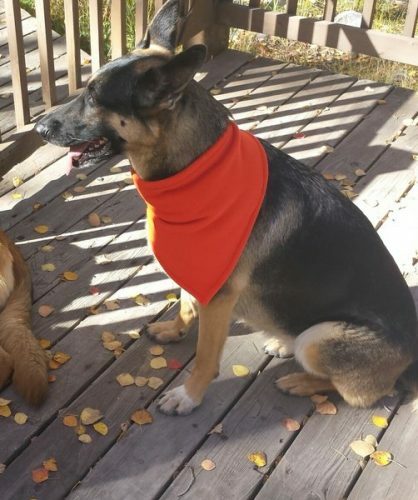 We make bright-orange collar tubes and bright orange bandanas for warmer weather. For cold weather we’ve added a bright-orange Power Shield high-loft for your hunting dog’s coat. This is a bold, bright, orange coat which will be easy to spot in most outdoor situations. We’ll be adding sweater-weight orange fleece dog sweaters for spring and fall. We’re also happy to make a hunting dog coat, dog sweater or other accessory from the fabric of your choosing.